I love retellings and have been trying to dive some more into science fiction. So when I stumbled upon this retelling of the legend of King Arthur, I honestly kept my fingers crossed I’d be able to get approved for the eARC – and I did! When looking into it a bit more, before I started reading, I discovered that both the authors are part of the LGBTQIA+-community as well. I was so, so ready to start this story! So, without further ado, here’s my review on a science fiction retelling, written by queer authors and drenched in queerness! Can I just start this by saying I loved the diversity in this story? Like. A short “LGBTQIA+” in rep doesn’t even cut it when it comes to Once & Future. There’s genderfluid rep, use of they/them, gay rep, ace rep, more queer rep and even more queer rep! Like. You should totally read this book to find all the identities represented in this one. Best thing? The story is simply set in a world where all sexual identities are accepted and seen as normal. I lived for it. I absolutely freaking loved it. Apart from that, we have Ari who’s from Arabian decent, Gweneviere who’s from both Asian and European decent and more! So the diversity isn’t only sexuality-related. Because too many people believe that difference is the enemy of unity. Other twists that made this story worth reading in my eyes? King Arthur’s reincarnation is a girl – a queer girl at that. Merlin ages backwards and, you guessed it, is queer! But back to Ari – who’s pretty much an illegal immigrant preparing herself to battle against oppression. Can this be even more awesome, right? She’s stubborn, she’s impulsive, she loves fiercely and fights for the ones she loves. All things I love seeing in a main character and this time was no different. That’s what resistance looks like, Merlin. It’s not one glorious, shining victory. It’s a torch that you keep burning, no matter what. As for Merlin? How can you not love a backwards-aging magician who only now starts to realize he’s allowed to care about other things than trying to fulfill the first King Arthur’s legend? So endearing and.. even though he’s very, very old.. You can’t help but like his faults and the way he still makes mistakes along the way. Although you do start to wonder why in hell’s name he does certain things at his.. age.. You’d think he’d know better by now, right? Then there’s the building of.. well.. the universe. I love how our own earth was entirely destroyed with all human beings living on different planets throughout the universe. It might be science fiction, but in a way it does feel like it’s possible. The way it’s done in the book.. felt like it made complete sense. Also the way how there’s one sole company ruling every aspect of people’s lives.. I honestly thought it was all very well done and thought-out. In any case, the very diverse cast of characters, combined with a very unique retelling of King Arthur’s legend, the way everything in the universe fit and my inability to stop reading made this story so worth it for me! There are two minor things I struggled with, but I jotted those down when I was in the middle of reading Once & Future. By the time I finished it, it didn’t bother me all that much but I still wanted to mention them in my review. It might be lame, but I really didn’t like how the author named three of the characters Val, Lam and Kay. Too many short, three-letter names with a’s for me and I couldn’t help but confuse them with one another. It definitely made sure I had to be on top of my game when I was reading or things wouldn’t have made sense at all at some point, haha. I do get why those names were chosen, but.. Yeah. I don’t know; might have just been me. A bit more important when it comes to lesser things while reading Once & Future, is how some relationships progressed without the reader really seeing it. The changes happen and there’s that – you just have to deal with the way relationships are at that point even though you’re.. confused as to how things came to be that way. You could say it adds a different vibe to the story, which is certainly true, but I like seeing the changes in relationships too much to simply accept things like that? I want to see and feel what our characters go through, so this was definitely something that irked me at times. Got to admit that my “bad” points don’t really have that much impact on my rating. 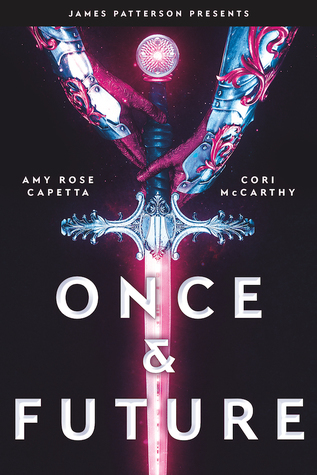 Right now I simply cannot wait to get my hands on the sequel – and buy myself a finished copy of Once & Future. What are your initial thoughts about a sci-fi retelling of King Arthur’s legend? Would you read this book? Or is sci-fi a genre you don’t really tend to pick up? Do you know any other science fiction retellings? I’m so excited about this book and now you made me even more excited!! I might pick it up next week. Wow. Sounds like this one packs quite a punch! Glad it was so awesome.